Everyday wear and tear can take its toll on your favorite office furniture pieces. Not only is Office Furniture Unlimited in Greensboro a great place to save money on new and used office furniture, the team can also save you a lot of money by repairing some of the office furniture you already own. Chairs, desks, file cabinet laterals, panels systems and just about any type of office furniture can be repaired in just 3 to 5 days. One of the most common issues with office furniture is a chair which can no longer be raised or lowered. This is because the hydraulic cylinder has worn out. If the chair seat and upholstery is still good, then it can more than likely be fixed. Bring it to Office Furniture Unlimited and the technicians will replace the cylinder, clean the chair and return it to you in excellent condition. If you purchased the chair new from Office Furniture Unlimited, it may be under warranty and the parts will not cost you a thing. Another common problem with office chairs are broken casters which are the wheels and it’s parts. These can be replaced as well as arm structures and other parts in usually less than a week. 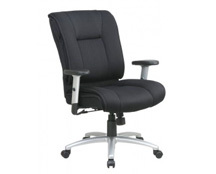 New chair casters and arms make a chair in a home office or other workspace feel like new. Broken drawers can ruin the overall look and feel of your beloved desk or file cabinets. Instead of throwing the piece out, bring the piece to Office Furniture Unlimited. Our professional repairmen can easily repair the drawer by fixing the shape, replacing the hardware or even custom building a replicate. Try as you might, there is no way to repair deep scratches to office furniture on your own. Instead of throwing a coverup on it, or worse, throwing it out, consider having us repair it. We have the proper tools and know-how to sand down and refinish the surface. Our office furniture repair techniques apply to all office chairs, any and all desks, wooden cabinets, lateral file cabinets, waiting room chairs and tables, conference room tables and chairs, and just about any office pieces you have. There are many reasons to have old office furniture repaired instead of throwing it away. Many of our customers are starting new businesses and take advantage of our office repair services and used furniture to help them save money. If you are in search of a less expensive option for your home or business office furniture, used or repaired office furniture is a great option. Bring your broken office furniture into the showroom on Lee Street and our helpful technicians can give you a quote on the spot that we are sure you will find reasonable and affordable.